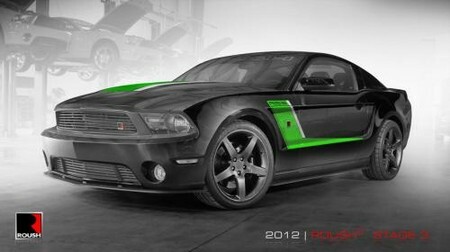 Roush has always been one of the best Mustang tuners in business. And they still are technically, but they seem to have lost their taste in styling! The 2012 Stage 3 Mustang comes with a fabulous supercharger which offers bucked loads of power, but the looks has not turned out to be a complete success. ROUSH Performance is now offering a wide palette of color options for the RS3 with 8 choices for the base vehicle color, 6 stripe colors, and 6 stripe accent colors. Together, these options offer an impressive 288 unique color combinations. That’s fiddly. As for the engine, the 5.0 liter V8 comes with the R2300 ROUSHcharger, force-feeding up to 12psi of inter-cooled energy to the already robust Coyote engine which increases the base horsepower from 412HP to an impressive 540HP and 465 ft/lbs of torque. To enjoy the ride, ROUSH Stage 3 (RS3) vehicle owners enjoy peace of mind with ROUSH’s 3 year/36,000 mile power train warranty. The stage 3 is priced at $59,945 which sounds fair for a unique 540 hp hot rod.